Kraftin Kimmi Design Team and found that there was an opportunity to try for a GDT spot! Not only was I required to use a Kraftin Kimmie image but I had to include a metal embellishment/paper/colour - as you can see I opted for gold colours in my image and gold metallic cardstock for both mounting and embellishment. He looks wonderful! 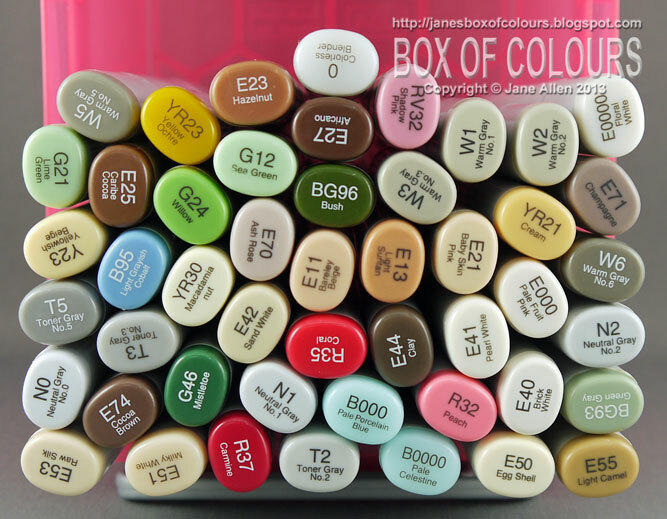 wow can you colour!! what a brilliant card, and I adore it. Isn't it amazing what we have hidden away! Glad you found the image and he looks wonderful. Good luck with your GDT spot! Brilliant! They would be foolish to overlook you! 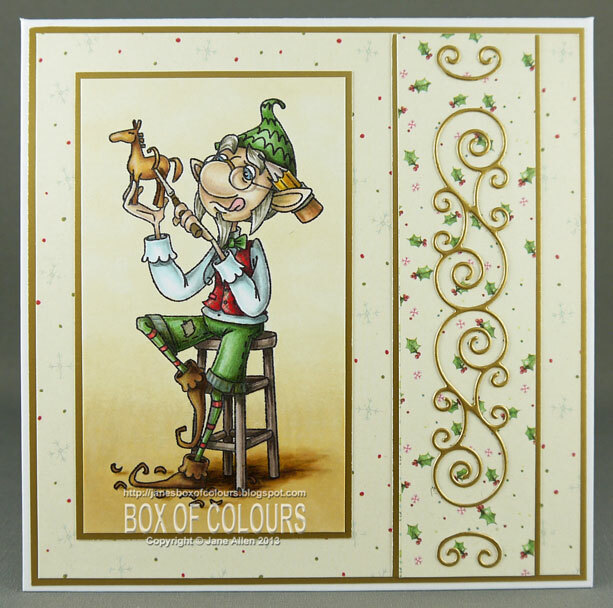 Fabulous image and colouring Jane..love your card..love the design and details..
Gorgeous card Jane. The Toymaker looks fabulous and your colouring skills are ACE! WOW!!! Your coloring is FABULOUS!!!! Sure glad you found this in your stash cause it needed to be stamped, colored and seen by us. :-) Fantastic entry for the guestie spot Jane. Hugs! Good luck with the GDT Jane - they would be mad not to want you and your amazing talent!! 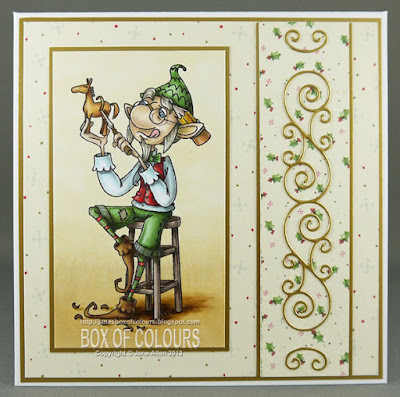 Your colouring blows me away every card and this is no exception!! Not only is this a GORGEOUS card you now have a big head start on your Christmas cards!!! Very impressed! 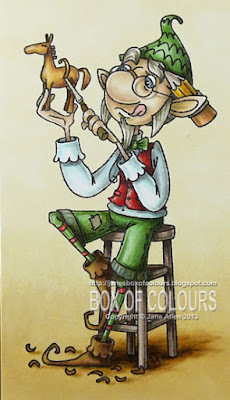 lol, I LOVE toy maker elf and this is a stunning card Jane. Keeping my fingers crossed for you!! HE HE HE!! Totally funny. I love this image and of course you have coloured him in super..
wow! gorgeous coloring and love the classy design. fabulous card, Jane! WOW!! Your colouring is stunning! I had to go back and double check that you actually coloured this. I thought maybe you had done some fancy computer work to it. It's flawless! Really great work. Good luck on the guest designer spot. 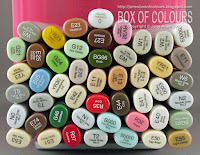 Fabulous colouring and such a great image love the soft background you have around the image. I love Pinocchio and this stamp looks like Geppetto, his father... this remember me my childhood. They would be mad not to have you as guest Jane. Love your shadowing. For what it is worth you have my vote. Wonderful card.